There are books which make you cry, there are books which make you think. And then there are books - which rip your soul apart. The pages slip by in your hands, the book ends. And you sit there, quiet, complacent. You get back to your daily chores. But somewhere, those pages beckon you, the words haunt you. Words - the power of words. Words from the Fuhrer, from a Jew, from a German and then, from Death himself. Words break you, they shake the world beneath you. The Book Thief, shakes up your body and soul, every inch. Who else can be a better narrator to describe Nazi Germany other than Death? But when events such horrific unfold, Death himself is dumbfounded. What can we humans do then, who are mere pawns? If tears come rolling down your cheeks when you read this book, do not hold back. Weep, shed few tears in the name of humanity. 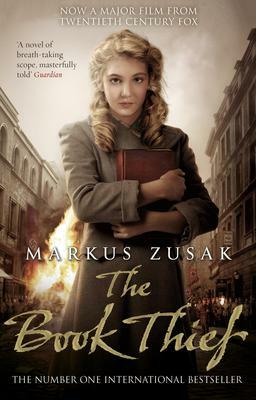 The story revolves around a girl named Liesel, who is adopted and is raised by her foster parents. Liesel loses her own biological brother when they were coming to her foster home.T he era is Nazi Germany, and Liesel has to grow up amidst war, hatred, and bloodshed. In what looks like an otherwise gloomy world to live in, Liesel finds peace and solace in her kind-hearted, doting, foster father Hans Hubbermann. He recognizes her unquenchable thirst for reading and learning when he finds out that she stole a gravedigger's handbook in her brother's funeral. her to read and write, and the Book thief keeps stealing books, one after another, at the right opportunity. One, she steals from the burning pile of books set ablaze by the Nazis, and many from the Mayor's house. Few are gifted to her by her own foster parents. Her father encourages her to read - read in a bombing shelter to keep people away from panic, read to a heartbroken mother who has lost her son in the war, read out to a sick Jew, Max, who seeks shelter to escape the concentration camp. Her foster parents take a very risky decision to conceal a Jew in their basement. Liesel befriends Max, who with limited means, is very articulate in penning down his own thoughts on paper- the plight of Jews and his hatred for Hitler. Her relationship with her best friend Rudy, with whom she races, steals and shares everything until he succumbs to the bombing, is heartbreaking. In the end, nothing remains; Death arrives, to collect all the souls and witness their last visions. But what Death sees, amidst the gruesome mass murder and the wave of hatred prevalent in Nazi Germany, is the strong bond of love and the unseen power, connecting a father and a daughter, two friends, a German and a Jew , a rich lady and a poor girl - the power of words, which books can bring, essentially binding humanity together. In Summary: Should I summarize? Haven't I said enough?? Your can get your copy at Amazon.